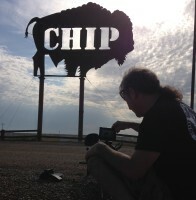 In the summer of 2017, bikers from across America journeyed to the Legendary Buffalo Chip in Sturgis, South Dakota in search of God, Country and Truth. Featuring the music of The Eli Seals Band, Bearing Armor, and Christine Black Vincent, along with an amazing jam session where the bikers write a song with Eli Seals that pays tribute to the Chip. .
Eli Seals and his band jam on "Meet Me at the Crossroads" just minutes after writing the song with a crowd of bikers at the Legendary Buffalo Chip in Sturgis, SD during the Light Up the Hills Rally. 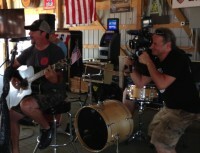 Check out this great clip from the Hit Me America Jam Session at the Crossroads Bar at the Chip. Christian Bikers from across America gather at the Legendary Buffalo Chip in Sturgis, SD for the Light Up the Hills Rally and to write a song with the Eli Seals Band. Some of the bikers showed up at the iconic Studio In The Country to be part of this historic recording of "Meet Me at the Crossroads", the first song written at the Chip with bikers..
For 16 years, Billy River rode with the most notorious and violent biker gang in America...he was a one-percenter. Billy spent more than a decade in prison on a variety of charges, including burglary and smuggling illegal aliens across the U.S. border. After years of struggle and self-loathing, Billy gave his life to Christ and turned his life around. Eli Seals and his Band perform "Meet Me At The Crossroads" during his live performance at the Legendary Buffalo Chip in Sturgis, South Dakota. Eli wrote the song in a Hit Me America Jam Session earlier that day at The Crossroads Bar at the Chip during the Light Up the Hills Rally with an audience of bikers from across America. See more at: http://www.hitmeamerica.com/ #hitme #hitmeamerica #buffalochip #crossroads Copyright, Hit Me America All Rights Reservedd. This is the official video for the new song "Sing, Pledge & Pray" by the Eli Seals Band. This song is dedicated to Veterans everywhere who have proudly served our country. Eli Recording Vocals for "Sing Pledge & Pray"
Eli Seals lays down the vocals for his powerful song "Sing Pledge & Pray" at Rabadash Studios in Covington, Louisiana. He also shares his story on what motivated him to write his patriotic anthem. Eli and his band perform "Sing Pledge & Pray" live in front of a packed house at The Landing Bar & Grill in Slidell, Louisiana.